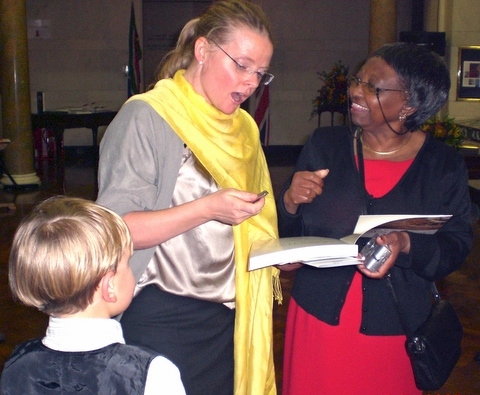 Thuso Chair, Mmapula Tladi-Small was the principal guest of the High Commissioner at South Africa House on November 18th where her father’s life and artistic talent was honoured with the launch of a book, “The Artist in the Garden” written by Angela Read Lloyd. The book tells of Moses Tladi’s time as a gardener at the Read family home near Johannesburg in the 1930’s. He started painting with leftover house paint and a stick and was encouraged by the art-loving Read family. Moses was the first black painter to have work shown in the National Gallery in Cape Town – although he was not allowed to see them in situ. 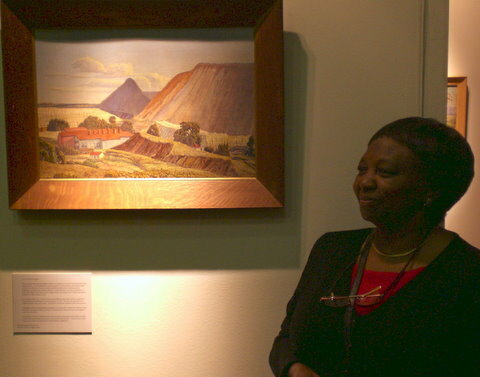 The author, Angela Read Lloyd, a descendant of the original Read family, gave a speech about how she managed to rediscover Moses whose whereabouts were unknown for decades – and how he was inspired by the garden of the Read family home and the landscape in which his own home was set. Sadly he never painted again after the family was forcibly removed from their home to Soweto in 1956. Mmapula then made a very moving speech in which she gave an account of family life with her dearly loved father. She related how the forced removal to Soweto destroyed the spirit of this instinctive and gifted artist and how sad it was that he never knew he would eventually achieve worldwide acclaim for his paintings. The book “The Artist in the Garden” by Angela Read Lloyd may be obtained from www.gazellebookservices.co.uk at the price of £25. It is full of Moses Tladi’s magnificent paintings. During their visit to South Africa in 2008 our Chair Mmapula Tlad-Small, and Trustees Elaine Daniel and Tania Collins visited the above organization in the Pretoria area. The name means “All is possible by strength in unity”, and the women who run it are all retired health workers. They are currently looking after Aids orphans whose ages range from a few months to 19 years old. Over the last 6 months we have been collecting children’s clothes, small toys and books, soaps, toothbrushes and windup radios and torches to send to Azwikundi. The windup torches are of huge benefit as candle fires happen all too often in homes killing and maiming children. To date we have sent about 50 two kilo parcels. In October, Elsie Etsane, who is the director of the cooperative, arranged a “Children’s’ Day” to take place on which the clothes and toys etc. were handed out to the children. The local press published an account of the day and we will put up photographs of the event as soon as they arrive. The need for help of this kind is ongoing and ever growing. If anyone has unwanted children’s clothes and girl’s bras in good condition, soaps or deodorants – we would be glad to send them to Azwikundi. Please contact us on email – info@thuso.org, or call 07508 038472 to arrange delivery or collection. Azwikundi fundraise by making beaded jewellery to sell. Thuso has bought from them over the last couple of years and sell the jewellery at local events and also from this website. We are placing a further order this month and hope to have a new, exciting range to offer in the near future.